"Merlin's beard!" That brilliant quote that's been told time & time again is now said by Eddie Redmayne in Fantastic Beasts & Where to Find Them, an excellent spinoff of the Harry Potter franchise. Set in 1926, Redmayne plays Newt Scamander, a Hogwarts alumnus interested in magical beasts traveling to New York on his way to Arizona. While in New York, he hears a woman named Mary Lou Barebone (played by Samantha Morton), a No-Maj (American Muggle) speak about how dangerous witches & wizards are. Distracted by this, a beast called a Niffler sneaks out of his magical suitcase, & in the confusion of trying to find it, a No-Maj named Jacob Kowalski (played by Dan Fogler) mistakenly walks away with Newt's suitcase. 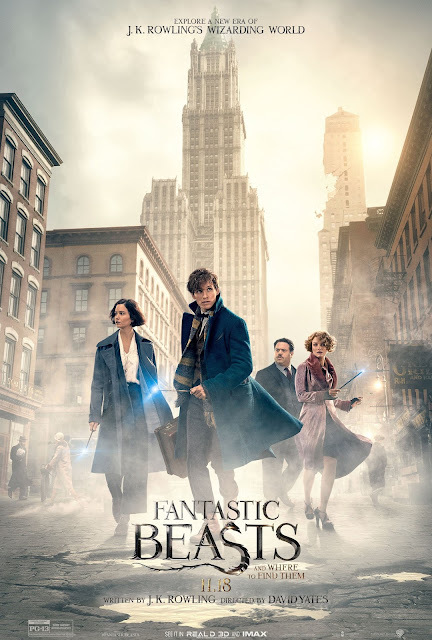 Because Newt is an unregistered wizard, he is arrested by former Auror Tina Goldstein (played by Katherine Waterston), hoping to get her former position back. However, Seraphina Picquery (played by Carmen Ejogo), President of the Magical Congress of the United States of America (MACUSA), & Auror Percival Graves (played by Colin Farrell) dismiss the case. After Jacob discovers the beasts in Newt's suitcase, Newt & Tina find them & take him to the house of Tina's sister, Queenie (played by Alison Sudol), who is a Legilimens (she can read minds). Queenie & Jacob become instantly attracted to one another; however wizards & No-Majs cannot get married or interact with each other. Meanwhile, strange incidents occur around New York, believed to be caused by an Obscurus, a dark force created by children forced to conceal their magical powers. Graves visits Creedence Barebone (played by Ezra Miller), Mary Lou's adopted son, & offers to free him from Mary Lou in exchange for helping find the Obscurus. After a Senator is killed, Newt is believed to be the Obscurus, & both him & Tina are sentenced to death by MACUSA; however, they escape, & it's now up to them, along with Jacob & Queenie to stop these events. The acting is great, especially Dan Fogler's performance. David Yates's direction is great, along with J.K. Rowling's screenplay. The cinematography by Philippe Rousselot is wonderful. The film score by James Newton Howard is excellent. And the costume design, production design & makeup & hairstyling are all amazing. This is an excellent rebirth of the Harry Potter franchise.